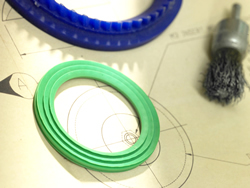 Rubber Moulded Valve Seats – Manufactured to effect a seal in numerous types of valve application. We have valve seats sealing such products as Ink, Water, Milk, Oil, Foodstuff, Chemicals. Solid Rubber or Rubber bonded to Metal parts. Please visit our section on Injection Moulding as Thermoplastic rubbers could provide a cost effective solution. Metal inserts can be included if required.